Pretoria, South Africa – South Africans face the risk of another disastrous police appointment by President Jacob Zuma, who has a record of undermining people’s safety by picking unqualified and dishonest people to head the South African Police Service (SAPS). Police minister Fikile Mbalula said on Tuesday, 7 November, that Zuma was poised to appoint a new national police commissioner. The president is once again ignoring the National Development Plan’s (NDP) proposal for a transparent and merit-based process to choose the right man or woman as South Africa’s top cop, Corruption Watch and the Institute for Security Studies (ISS) said. The NDP and its policing recommendations have been endorsed by the ANC and the cabinet. ‘If Zuma fails to implement the NDP recommendations, he is once again snubbing cabinet, his party and Parliament, and neglecting the urgent need for skilled police leadership to bring down violent crime,’ said Gareth Newham, head of the ISS Justice and Violence Prevention programme. After nine years of Zuma’s presidency people are far more likely to be murdered or attacked in their homes or on the streets by armed criminals. Violent organised crime has spiralled out of control and, through the actions of corrupt politicians and business people close to the president, the country is bleeding billions of rands that could be used to uplift the poor and fund education. Zuma has a poor record of policing appointments, the ISS and Corruption Watch said. First came Bheki Cele, who had no policing experience but was appointed in July 2009 then fired in October 2011 after a board of inquiry found he was guilty of maladministration. Then in June 2012 Zuma appointed the inexperienced Riah Phiyega, whose reputation will forever be disgraced for her role in the police shooting of 112 striking miners at Marikana, killing 34. Phiyega was suspended in October 2015 following the Marikana Commission of Inquiry findings against her integrity and competence. Despite a judicial board of inquiry recommending he fire her, Zuma allowed her contract to conclude while she received full pay, pension and benefits. As a result, South Africa has not had a permanent SAPS national commissioner for more than two years, during which time serious violent crime has increased significantly. The incumbent Lesethja Mothiba is in an acting role. 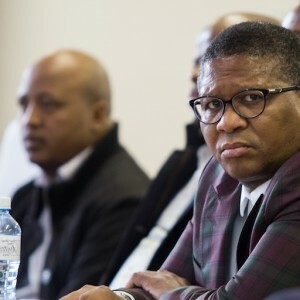 The ISS and Corruption Watch called on Mbalula to urgently implement the NDP recommendations by establishing a national policing board to develop the criteria for SAPS commissioner. An independent selection panel should then assess potential candidates against these criteria in a transparent and competitive manner, with public involvement. The minister and his ANC colleagues who want to make South Africans safer have a duty to convince the president to implement the NDP recommendations that his cabinet and the ANC adopted in 2012, and which Parliament has been calling for, the ISS and Corruption Watch said.